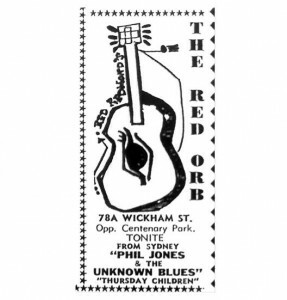 Special thanks to David Rowlands who sent me some interesting info and pics relating to venues “Phil Jones and the Unknown Blues” toured from Sydney to Brisbane in 1967. They travelled by train with all the band equipment with one member driving up. The boys were accommodated in a flat at Coorparoo. The main venue they performed at was Cloudland playing with “Thursday’s Children” which a few of our readers remember. The two shows were on Saturday afternoon and evening. I love an afternoon show! They then played shows at Prinz Alfreds in Adelaide Street, The Red Orb then at Danceland at the Gold Coast. The next gig was called The Boat-trip. It was on the MV Mirimar which later in it’s life would take people to Lone Pine until it’s retirement in 2009. They played for mainly teenage girls whilst the boat cruise along. The boat came and moored at an island in the bay (I’m thinking maybe Moreton? ), all the passengers disembarked and walked across to an open air stage. The band played another rest then all rebounded and returned to the city. Sounds better than some of those other boat cruises. The next venue astounded me – I did not know this existed until David let me know. I knew of Snoopys club run by the YMCA but not of Snoopy Hollow. Snoopy Hollow was located in the top level of the City Council car park in Wickham Terrace. Who would have thought that we had a band venue there? Apparently the crowds were huge and the band were very welcomed. David reports that it was a great venue not only for it’s location but because the weather was so hot and humid it was a lot cooler on the roof. They finished their tour with an “out of town gig” at The Bowl at the Ipswich Tenpin Bowl. What a great tour with amazing venues. Thanks for sending through David. If you went to any of these shows or experienced any of these venues particularly Snoopy Hollow, let me know. This entry was posted in Clubbed Out. Bookmark the permalink. Snoopy Hollow or “Snoopy’s” was at the YMCA (Turbot? St)and I think there were about three ‘Snoopy’s on the Rooftop” in the car park. Many names come to mind like Ross D Wylie, Kerry Ann Wright (Kerry Ann Kennelly) Narelle someone I think who was on the TV with Kerry Anne in the afternoon. Perhaps the channel niners with Uncle Jim. The Flamingoes (Johnny Grey was lead singer and the drummer Curley’s wife was a teacher at Yeronga High). Vince Cameron compered and he later turned up on Melbourne Tv reading the news as Jason Cameron. I think Snoopy’s on the Rooftop had Johnny Farnham, Johnny Young, Ronnie Burns, Russell Morris Johnny O’Keefe but I might be mistaken with other venues like Festival Hall and Souths Rugby Club House. I remember little Bev Harrell at Festival Hall. David Greenwood also was involved with the YMCA and did some compering. He was on 4IP and I remember taking part in a walk a thon that he seemed to have organized to raise money for a charity. I remember TC Burns in the valley on Saturday morning and Adam and Eves. Then I seem to have preferred Sunnybank Hotel. Well, there’s my trip down memory lane. Good times were had. Ah! more sixties wreckage reminiscing about the wonderful days. Just a little more information about the venues mentioned so far. 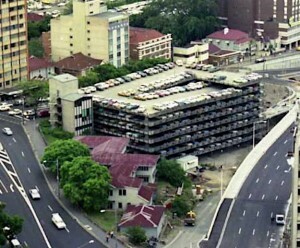 ‘Snoopy Hollow’ was originally situated in a classic old building on the outbound side of Edward Street just up from the present Diamonds International building cnr. Adelaide and Edward. Patrons would queue down the street and around the corner on a Saturday night. The building was only about three stories high with a large ornate staircase up which we’d assent until reaching a room packed with sweaty dancers. Resident band was the Flamingos. Great place to meet girls even if the ultra violet light turned teeth green and gave every one a fake tan showing up dandruff. Snoopies moved to Winsor into the new Y.M.C.A. building, built with proceeds of the city venue but it was never the same. Adam and Eves in Brunswick was established sometime in the late 1960′s I went there in’ 68 wearing what I thought was cool polo neck shirt with a frilly neck that cost a weeks wages. A classy venue where Brisbane’s go set could be seen. Saw Russell Morris and Billy Thorpe live. 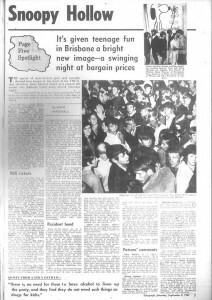 The Red Orb in Wickham Street was where Brisbane’s music elite hung out. Situated under a second hand shop that sold rifles, everybody behaved as if they were just too cool to bother with small talk, more into the deep and meaningful message of underground music. They had a tiny courtyard populated with moth eaten lounges where one could escape the heavy sound. I parked outside in my 1939 black Buick and basked in reflected glory. Then there was T.C.’s sound lounge in Elizabeth Street. You could ring up a table where your possible date for the evening sat and ask for a dance. Couldn’t hear a thing above the din so most just sauntered over and tried to win on. Went to Cloudland a few time in the 1960′s but too square. Mainly what we called 60/40 People only got up to dance to the pop numbers. They had old fashioned dances like the Pride of Erin or Progressive Barn Dance. Awful! ‘Snoopies was best in town but “The Scene’ was fantastic. One giant room with ear shattering music and a fabulous atmosphere. Plenty more stories from this rocker. I was one of the organisers of Snoopy Hollow. I believe the Avengers was the first house band. I recall auditioning the Masters Apprentices (later just the Masters). Ross D. Wylie was a regular and very popular. The ‘fluoro’ lights I made out of ice cream cans, a globe and some coloured cellophane. Lucky I didn’t burn the place down. The numbers were always far more than was safe. But people didn’t drink or smoke there. So we were lucky. If there had been a fire, it would have been a disaster as there was only one exit and people were packed in like sardines. After the first event (a one-off fundraiser) we held another four weeks later. After that, it became a regular event. Snoopy on the rooftop was an experiment that was successful beyond our dreams. Well that’s some of what I remember. Sorry Rob, I don’t remember you, but I was on the committee for Snoopy Hollow for a short time. I also used to stand at the light switch at keep the lights flashing for the bands (very basic) This would have been around 1968/69. I married Selwyn Wright who was the drummer for the Railroad Gin and then The Parade who played at Snoopy Hollow. I remember David Greenwood was on the committee at the time. I haven’t seen Sel for about 15 years. Last time we spoke he was living on the Gold Coast. I could probably track him down if you want. I played with Sel back around 1970. Now I muck around with some similarly aged guys once a week on the Gold Coast. Need a drummer.Was wondering if Sel might be interested, but don’t know how to contact him. Have an email?